The aluminum models are ideal for those who need to quickly tear down cranes and move them to the next job. 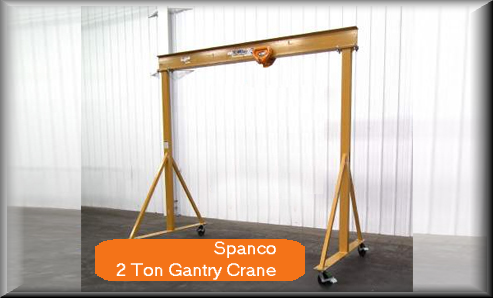 These cranes come in weights starting at 112 pounds to make it easy to transport them as well.Both the adjustable and fixed models can handle loads from 1 to 3 tons. Adjustable cranes are made to operate with a locking pin configuration so they stay securely at the height needed. The A Series cranes have a maximum capacity of 3 tons with a 2 ton capacity for those made of aluminum. Steel A Series cranes are available with spans to 40 feet and beam heights to 16 feet. For the aluminum cranes, spans are available up to 20 feet with heights to 12 feet under the I-beam. The E Series cranes include fixed height styles with spans to 12 feet and a ten feet height with a 3 ton max capacity. You can also rent these models with adjustable configuration and a span of 11’6” with a max adjustable height of 7 to 14 feet. The E Series cranes with adjustable configuration have a 3 ton max capacity or 2 tons for those made of aluminum. Steel models are available with spans to 40 feet and beam heights to 16 feet. The aluminum cranes have spans to 20 feet with heights of 12 feet under the I-beam. 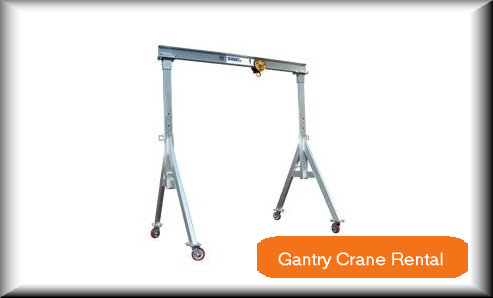 Our Gantry crane rental service makes it easy for all types of shops to get the quality crane equipment they need without the investment required to purchase for long-term use. This equipment is versatile to handle a wide range of jobs and durable enough to provide you with ongoing performance. We also have hoist trolleys for these cranes.